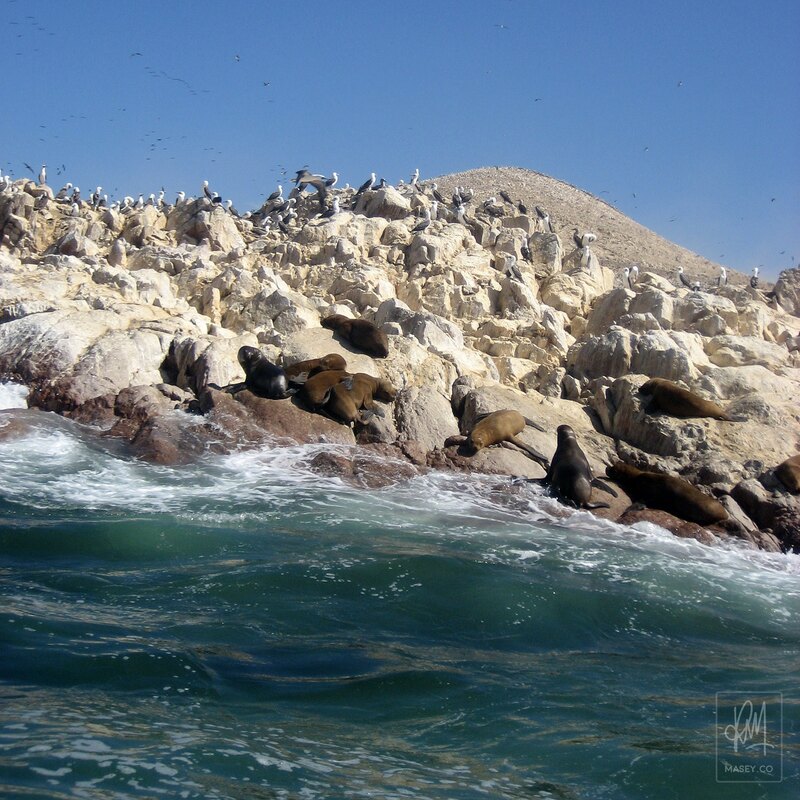 With a good sleep under my belt, it was up and at 'em early to be down at the Paracas fishing wharf where we boarded one of a number of motor boats which ferried us out to one of the most popular of all tourist attractions in this area – the Ballestas Islands. With life-jackets donned and everyone all buckled in and ready to go, the high-powered engines fired up and we headed away from the coastline. 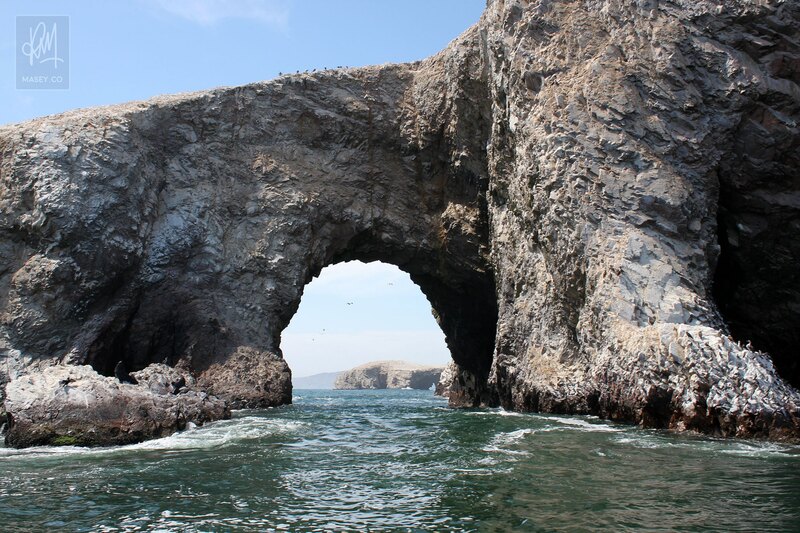 Passing the Paracas Peninsula on our way west, the first unmistakable site you come across is a distinctive shape etched into one of the coastal hills known as the Candelabra, or “El Candelabro”. 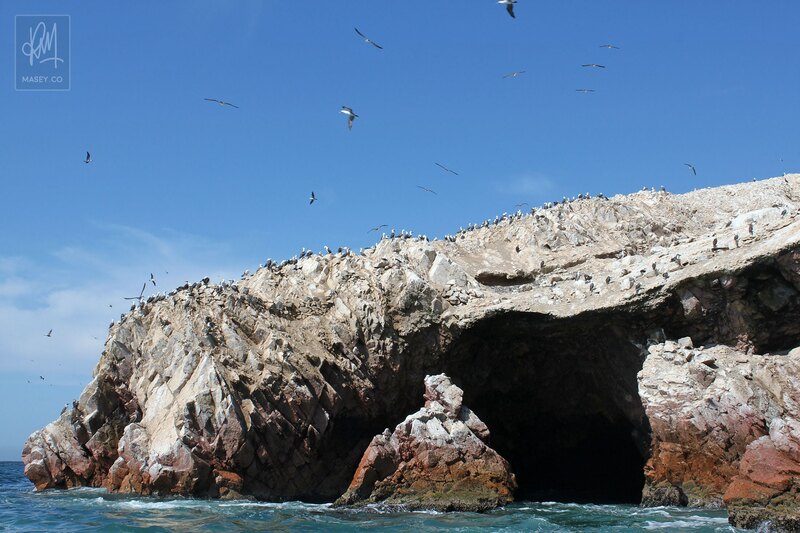 Little is known about the curious marking, but archeologists have suggested that it may have been created by an indigenous group known as the Paracas People, that occupied the area from 400 to 650 A.D. 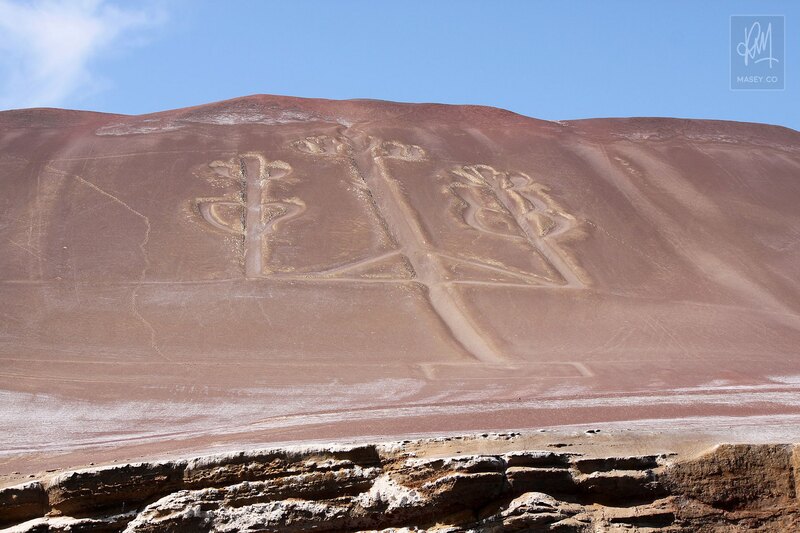 It is also assumed that, despite the name it has today, the carving is actually of a San Pedro Cactus, an important plant in this indigenous culture. Impressive. 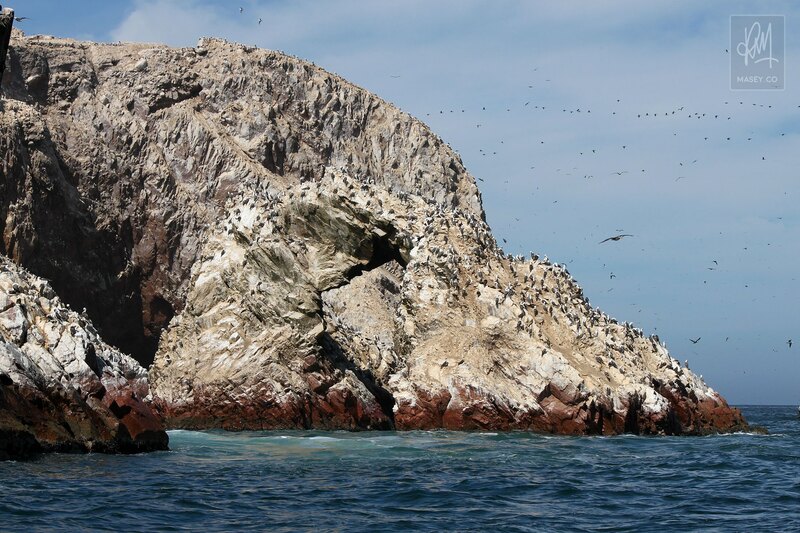 Considered one of the most important Peruvian wildlife sanctuaries for coastal species of bird and marine life, the Ballestas Islands, or "Las Islas Ballestas" are located about 15km south of Pisco and are a 2 hour round trip journey out of Paracas. 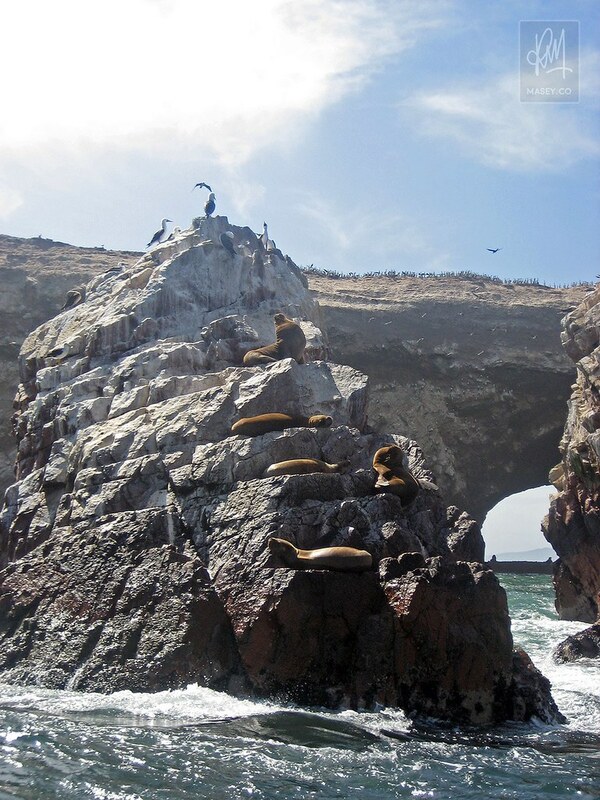 The main island which is approximately 600-700m long is an impressive site with numerous caves and arches to explore visually from the boat. 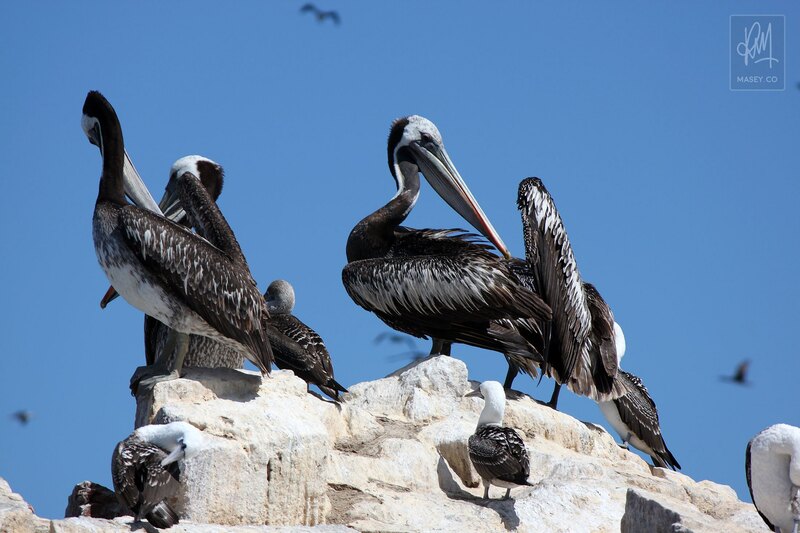 It's the 250,000 birds representing 150-200 different species that call the island home, however, that create the "WOW" factor that tourists flock (pun intended) to see. 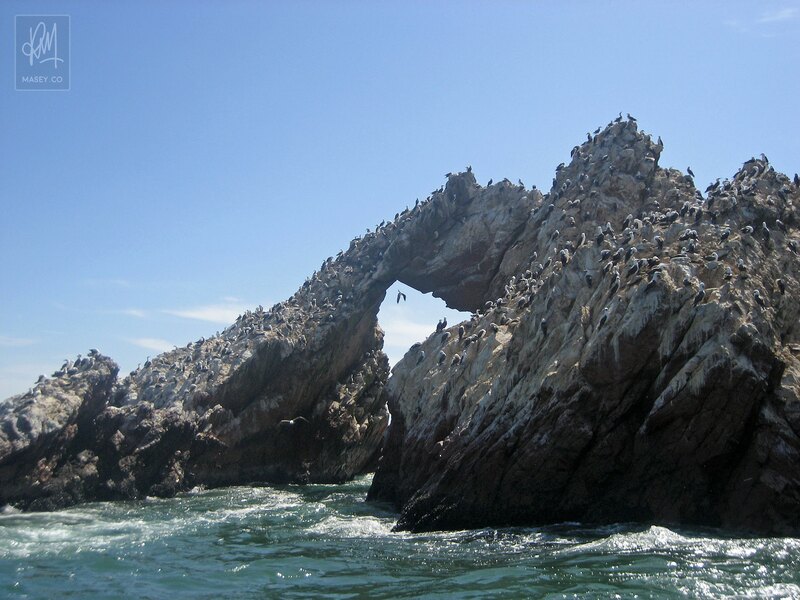 In our time floating the edges of the island, we managed to spy gulls, cormorants, pelicans, blue footed boobies, the Humboldt penguin and more. 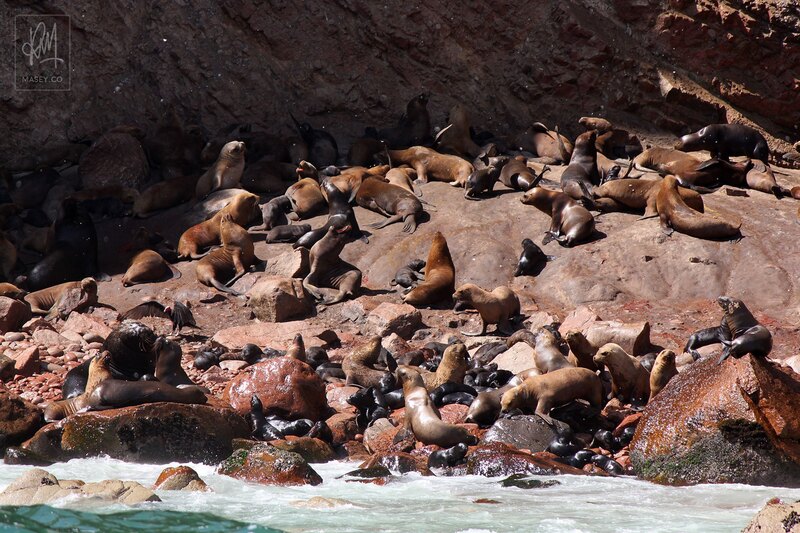 Meanwhile, perched on the beaches, several rocky outcrops and in the water around us were hundreds of inquisitive, noisy sea lions. If you haven't noticed it already by the photos above, then look closely at the colour of the rock at water level, then check out the colour anywhere above that. That's right, the island is basically white washed with bird poo. 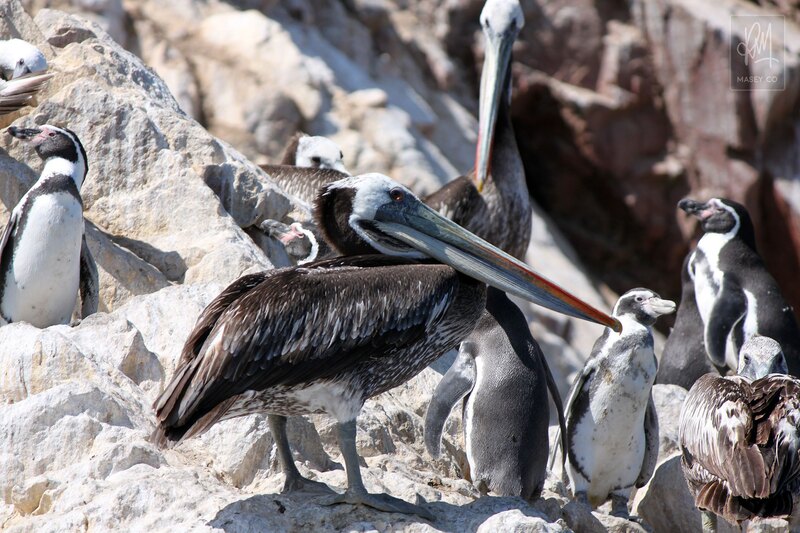 While you and I may screw our noses up at the thought, workers in the "Guano" trade rub their hands together. 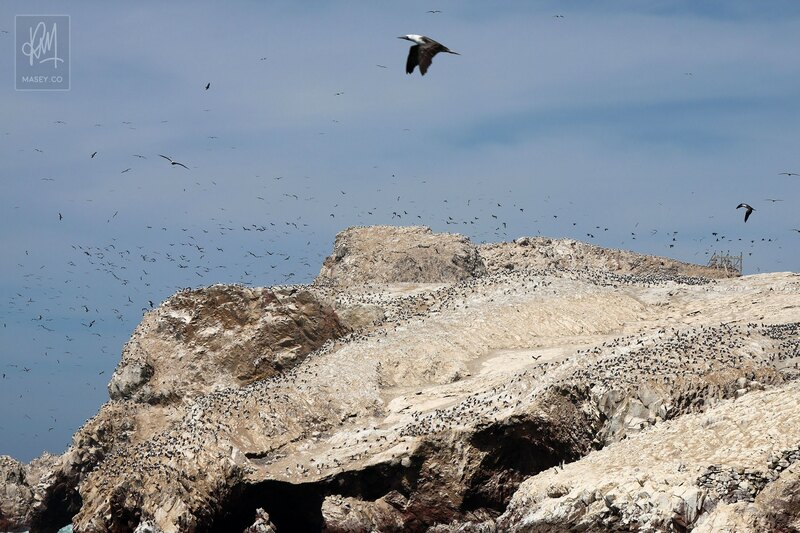 The Guano is collected and sold as quite an effective fertilizer. 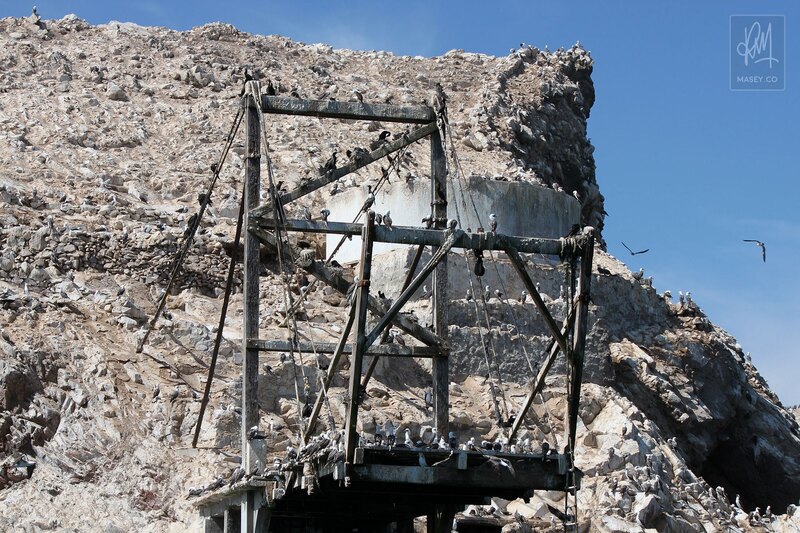 Because there is little to no rain in these parts, the guano falls and is baked onto the rock in the dry atmosphere, preserving the all-important nitrates in the droppings from evaporating. 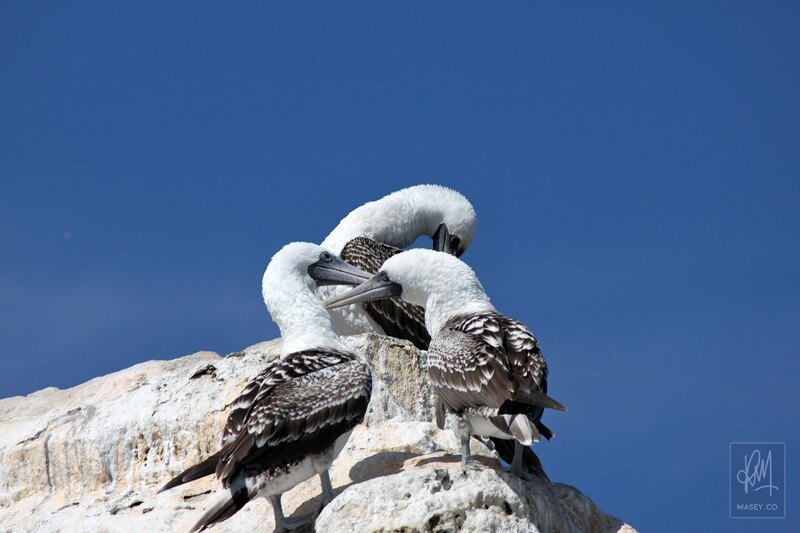 This maintained nitrate content makes the Ballestas Island Guano more effective and valuable than that collected from elsewhere. Returning to shore after 45 minutes or so of some pretty intense bird watching, we all piled into a mini bus and started making our way inland towards our next destination – Nazca. 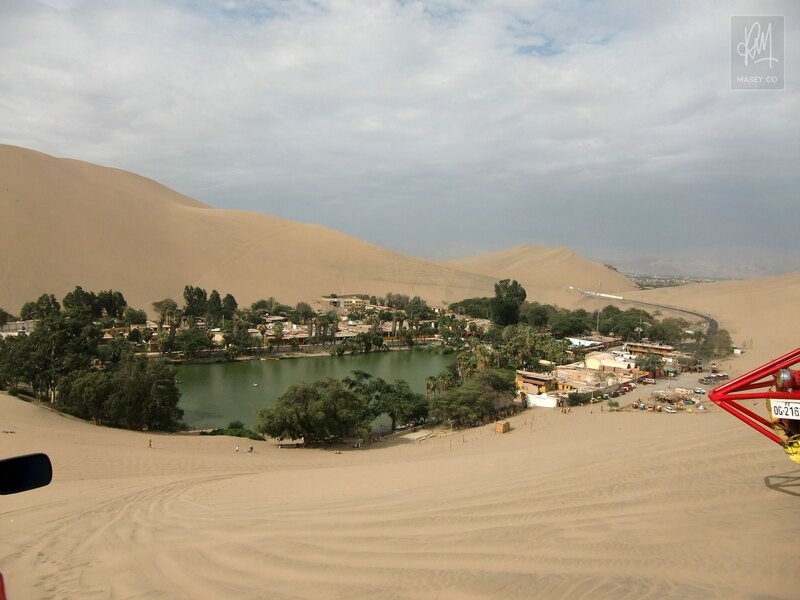 Along the way, we took a sealed road deep into rolling sand dunes until we hit the stunning palm-tree-lined lake of the Huacachina Oasis. 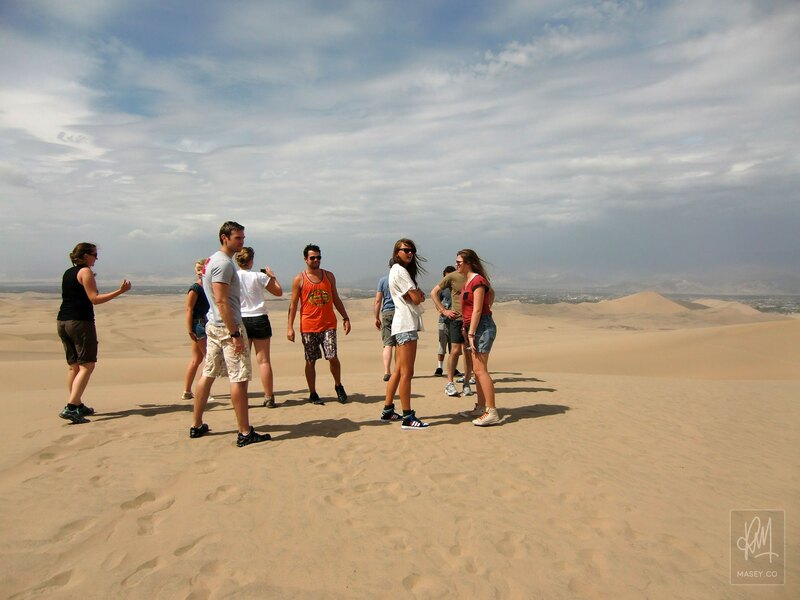 Now functioning as a Summer Resort, Huacachina is a popular spot for tourists (known as "Gringos" around these parts) to warm up and relax after having spent time hiking up in the Andes. No time for us to swim and relax today, however. 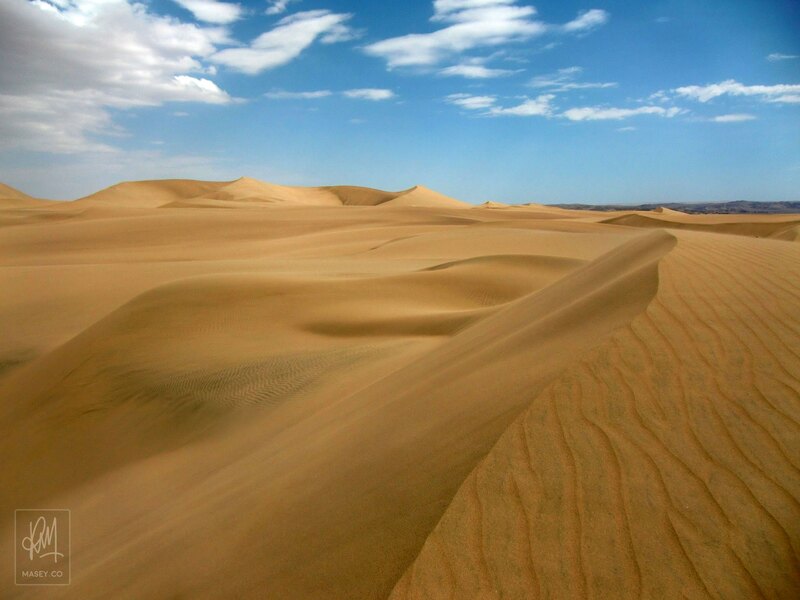 Almost as soon as we arrived, we were allocated a dune buggy to climb aboard as we were whisked off into the dunes on a roller coaster ride into the sandy unknown. It was a hell of a lot of fun, and although I had sand blowing into my eyes nearly the whole way, it was an experience I think everyone enjoyed. Once a good few miles from Huacachina and perched on the edge of some giant dunes, we pulled up and were presented with some pretty basic sand boards which we could use to throw ourselves down the dunes. There was a number of us who would dearly have loved to try the boarding standing up, but the primitive, over worn, velcro straps or binds on the boards certainly weren't up to scratch for those kinds of shenanigans, so it was all "on-the-belly" for those of us wishing to give it a go. For the first run at least, it was just the blokes that gave it a go, but over the course of the following few runs, some of the girls like Anna, Lou and Leonie gave it a shot too! Wipeout of the day certainly went to Sam on the last run as he did his best job of covering every square of bare skin on his body (and probably every non-exposed crevice too) with sticky hot sand. 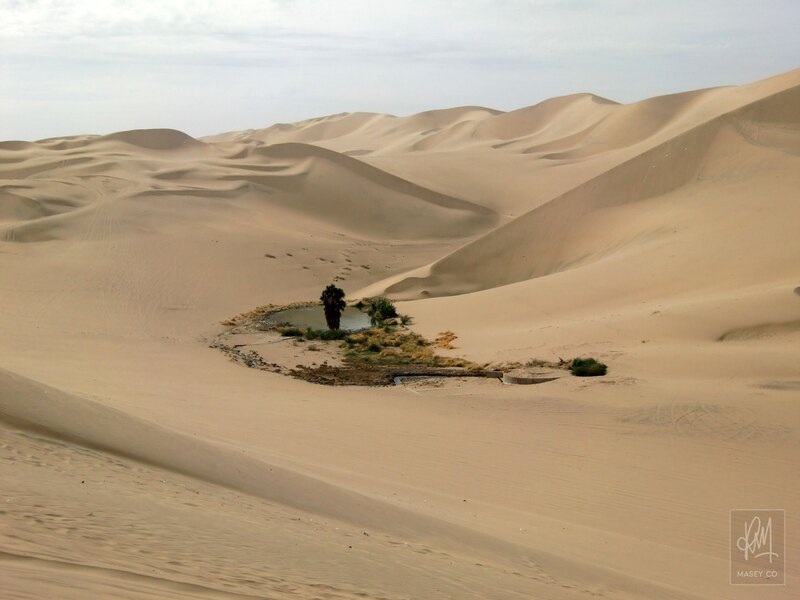 We got one last good elevated look at the beautiful Huacachina on the return trip, then upon our return, spent a good amount of time locating sand on our persons in places it should never have been! Seriously though, I swear I'm going to be chasing sand around my pockets and moccasins for the next few weeks. Really looking forward to that – NOT! Brushed down as best as possible, we settled in for a hearty lunch, cold beer and the opportunity to chat and laugh about our efforts in the sand dunes. With quite a few kilometers ahead of us before we arrived at our hotel for the evening, it was back onto the bus for a few hours traveling along the Pan-American Highway, stopping only for our first look at the region's famed Nazca Lines. 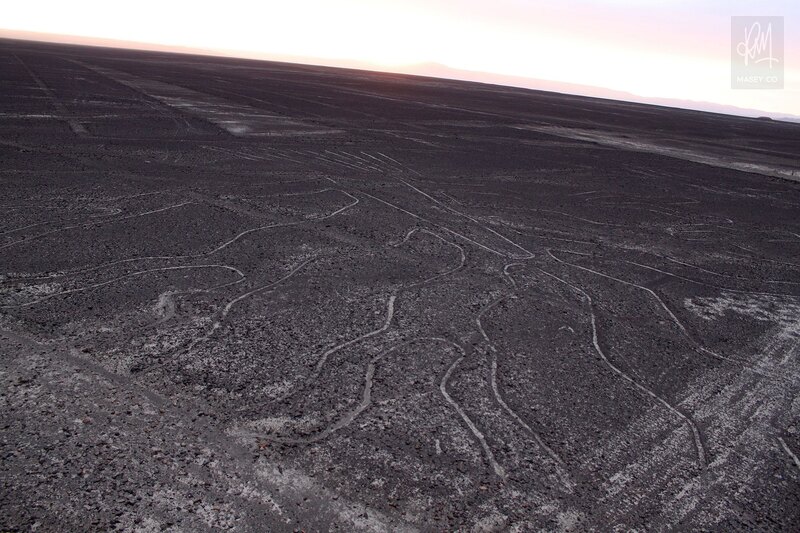 Discovered by aerial passes in the 1930's, the Nazca Lines are a series of geoglyphs spread across an 80km stretch of land between the towns of Nazca and Palpa on the Pampas de Jumana about 400 km south of Lima. It is believed the Nazca people of around 400-650 A.D. created, using simple tools and surveying techniques, the shapes of stylised hummingbirds, spiders, monkeys, fish, sharks, orcas, llamas, and lizards by removing the reddish rocks and dirt from the surface of the dry baron land and building trenches about 15cm deep, exposing the whiter earth beneath. Perhaps the most extensive research conducted on the mysterious lines was by German Maria Reiche. 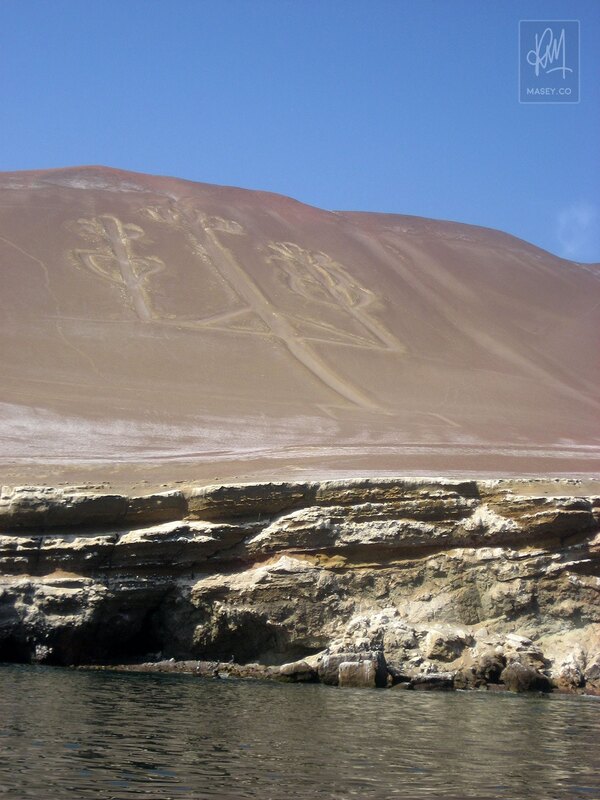 Reiche hypothesised during her 50-year period of studying them, that the Nazca Lines formed a large-scale astronomical calendar used in ancient times to record celestial events and to indicate times for harvesting, fishing and festivals. 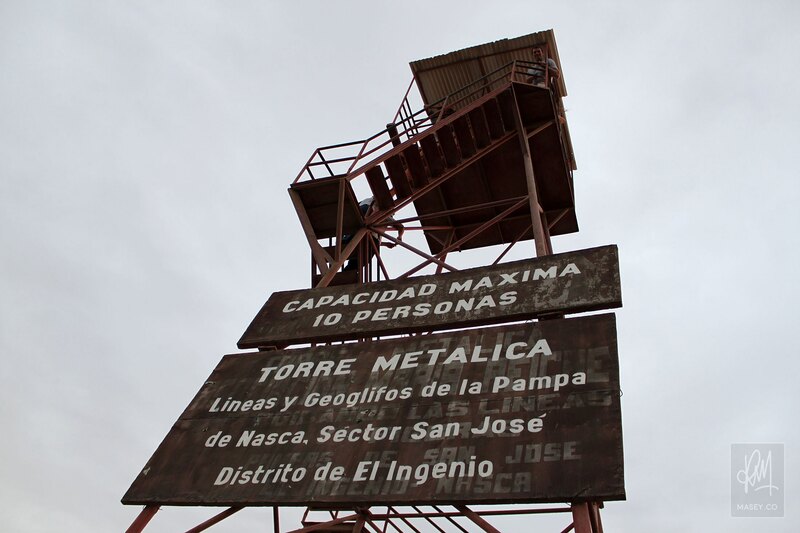 In 1976, Reiche, at her own expense, had a 12m high viewing tower, or "Mirador" constructed on the edge of the highway about 17km north of Nazca. From the tower, the "Hands", "Lizard" and "Tree" may be viewed, and it was here that we found ourselves this evening at sunset. As we are quickly becoming accustomed to here in Peru, everything you do on the tourist trail costs you something and the Mirador was no exception. What the heck people were doing all the way out there setting up tacky tourist trinket stores and sticking around till after sunset to charge passers-by S2 (USD$0.75) to scale the rickety old tower is beyond me, but we did so in the end anyway and people like me, who aren't shelling out the cash to head over them by air tomorrow, had the chance to see what all the fuss was about. In the photos above and below (thanks to Florian and Anna), you can see the distinct lines of the "Tree" carved into the desert floor. 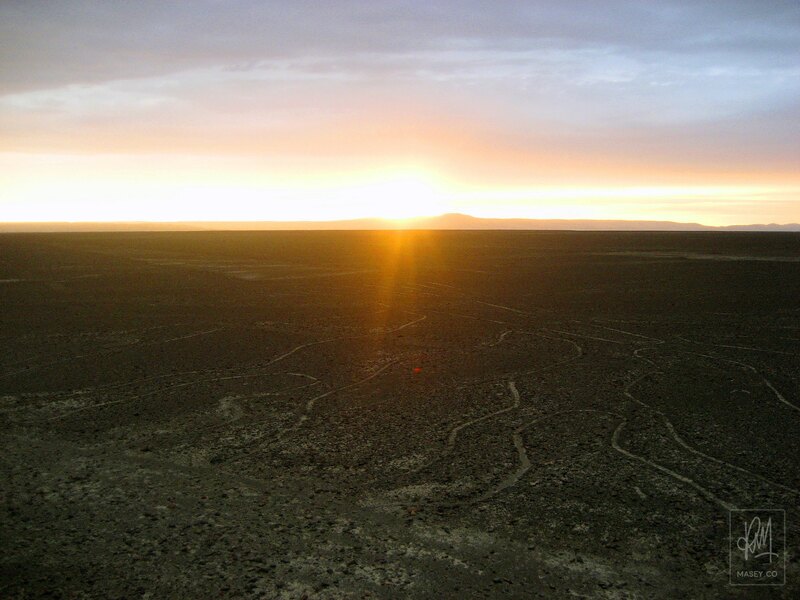 With high winds belting the tower and the sun rapidly disappearing behind the horizon, we didn't stick around for all that long, opting instead to push forward to our final destination at the end of a long, suspect dirt road – the basic Hotel San Marcelo. Check out the slick promo video I found for the accommodation below. Haha! A few relaxing beers and a bit of food into us, we called it a night ready for a big day out in the desert tomorrow. Again, a huge cheers to my pals Florian Liese and Anna Wiewiora for providing the visual candy for this entry! Thanks guys!